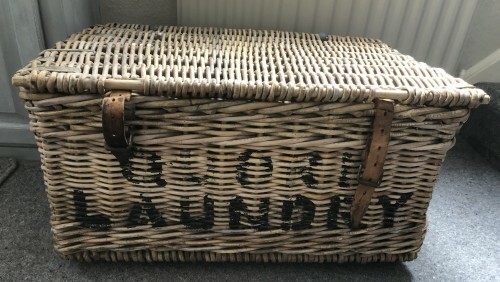 This Quorn laundry basket (or hamper) was used by the Pagets from Nanpantan Hall in Loughborough, but it would originally have been supplied by Quorn Hygienic Laundry on Barrow Road, so that the family could send, and receive back their washing, to and from the laundry. The dimensions of the basket are 30 inches wide (76 cm), 21 inches front to back (53 cm) and 15 inches tall (38 cm). It has ‘Quorn Laundry’ written on the front panel and a number 4 on the side. The lid can be secured with the sturdy leather straps and the hinges are cast metal. There are wooden battens underneath the base. It could have been made anytime from 1915, but probably dates from the 1930s or 1940s. Quorn Hygienic Laundry started in the village in 1915 and their premises were based about halfway down Barrow Road, where Quorndon Terrace is now, which is on the right, as you are going towards Barrow. The owner and manager was Harry Huntley, who was born in Essex, but had married Amy Edwards in 1899 in Nottingham and eventually the couple moved to Quorn. As Harry got older the business was taken over by their son Jack, who in 1939 is recorded as living with his wife Ethel, on Loughborough Road in Quorn. The laundry was established at a time when it was getting more difficult to get domestic servants, so to be able to send washing out to a laundry, reduced the workload within a household. As time went on it was not unusual for normal working families to use a laundry service, especially if women went out to work. Before people had domestic washing machines, washing big items, such as sheets and towels, could be extremely hard work, and very difficult to manage in small houses. Jack Huntley died in 1974 aged 73. The laundry was still operational in the 1960s, but the exact date of closure isn’t known. Can you help? Can anyone remember the laundry? Did you or your mum or dad work there? Do you know when it closed? It would be brilliant if you could contact the museum team with any information or memories! Missing information: Can you remember the laundry? Closure date? Memories? Anything please!